With the holidays just around the corner, your mind might be on mailing cards out to your friends and family. You should also consider another kind of cards this time of year -- card games! They make great stocking stuffers and classroom teacher gifts, and can entertain your family for hours during long, cold winter nights. Card games are a huge hit in my family. We own a wide variety of them, and we often pop a few of them in our bags on family vacations, dinners out, or even train rides. Nothing makes the wait time fly by faster than a few rousing rounds of Wig Out or Spot It! This, of course, is a classic that everyone must own. Kids of any age can play along side adults of any age. As you probably already know, players take turns in order placing cards from their hands onto the discard pile. The card must match the pile's card by color or number (or you may also use a Wild card). The goal is to be the first to get rid of all the cards in your hand. As I was researching this article, I was happy to see that there are other games you can play with a deck of Uno cards. One interesting one I hope to try out is Limonada. Each circular card in this game has eight images on it. Players scan and compare two cards to look for two matching images. There is some type of amazing mathematical formula that the creators used to assure that of the over 50 images possible on the cards, each pair of cards has one, and only one, common image. My family and I are fascinated by the game each time we play! How can there always be only one like image? But there is! (For all you math geeks, check out this explanation and video.) 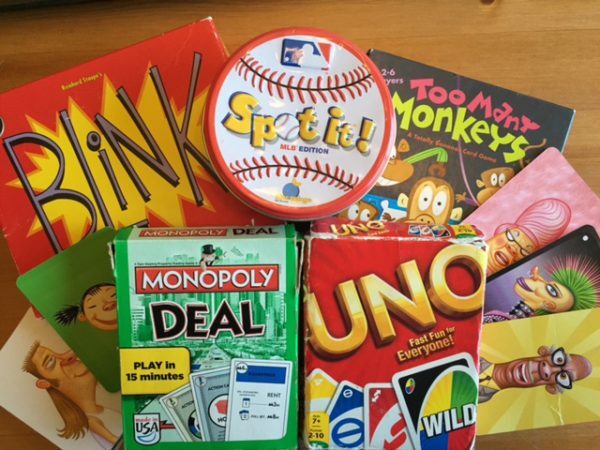 In addition to the classic game, there are many themed versions--baseball, sports, camping, Shopkins, numbers and shapes,alphabet--so you can find the right theme for your family or gift recipient. This deck of cards features 12 funny characters with various hairstyles -- Beatrice with a beehive, Eve with a green mohawk, Stevie with a bowl cut, for example. To play, all players simultaneously draw and play cards to make matches, trying to be the first to empty their hands and yell "Wig Out!" This fast-paced and frenzied card game always ends in laughter for our family! The story behind this game is that Primo the Monkey's friends stop by for a surprise pajama party. Your goal is to get all the friends to leave so Primo can go back to sleep. In this multiple-round game, you flip and swap out the cards in front of you to try to get a cards with 1, 2, 3, 4, 5, and 6 monkeys on them. Once you do, the next round, you only need to find cards with 1-5 monkeys, and so on until you are down to no monkeys. Be sure to read the directions of this game -- they are hysterical! For example, if you draw a card with a giraffe on it, rather than just say that this card is a dud, the directions explain "Sorry giraffe, but this party is a monkey-only slumber party. (You're too big to fit in the door!)" No time to play the full version of Monopoly? Monopoly Deal can be played in just 15 minutes! It is a bit different from the original game, but just as fun. Through dealing and stealing, you collect 3 property sets to win. My kids love strategically joining forces to gang up on me so they can win together! Each card in this game has a specific number and color of shapes. For example, 5 red moons, 3 yellow stars, or 1 blue triangle. Players race to discard the cards in their hands by matching the color, number, or shape to the card on the pile. When playing with younger kids, I suggest that you deal yourself more cards than you give them so it is more of an even game.